Masaccio (1401–1428), The Tribute Money (detail) (1425-8), fresco, 247 x 597 cm, Brancacci Chapel, Florence. Wikimedia Commons. Before I move on from Masaccio, the early southern Renaissance, and the city of Florence, I would like to take a careful look at narrative in the frescoes in the Brancacci Chapel of the church of Santa Maria del Carmine. Sometimes known as the Sistine Chapel of the early Renaissance, its walls were painted by three of the great artists of the 1400s: Masaccio (1401–1428), Masolino (c 1383-1447), and Filippino Lippi (c 1459–1504), the illegitimate son of Fra Filippo (Lippo) Lippi (c 1406-1469). Of the sixteen frescoes painted by these three, twelve remain in surprisingly good condition considering their age, and the fire which nearly destroyed them all in 1771. I first consider the four largest paintings, each showing complex scenes, then try to make sense of them as a whole. Four of the smaller frescoes which were painted by Masaccio are shown and discussed here and here. Although he does not examine narrative aspects of the frescoes in the same way, Eckstein’s monograph on the Brancacci Chapel is otherwise extremely thorough and beautifully illustrated. He also provides a very convincing account for Lippi being brought in to complete the paintings which I will not spoil by discussing here. View of the Brancacci Chapel, 9 February 2009, 11:31:27. Image by Sailko, via Wikimedia Commons. Masaccio (1401–1428), The Tribute Money (1425-8), fresco, 247 x 597 cm, Brancacci Chapel, Florence. Wikimedia Commons. This painting by Masaccio is based on a story from the Gospel of Matthew in which Christ directs Peter to find a coin in the mouth of a fish so that he can pay the temple tax; here Masaccio restages it and paints an unusual composite of the narrative, with three sequential events from the story incorporated into a single image. Moreover the events are not shown in temporal sequence. In the centre, the tax collector asks Christ for the temple tax, the first step in the story. At the far left, as indicated by Christ and Peter’s arms, Peter (shown a second time) is seen taking the coin out of the mouth of a fish, the second step. At the right, Peter (a third time) pays the tax collector (shown a second time) his due, and completes the sequence. Masaccio (1401–1428), Raising the Son of Theophilus and Saint Peter Enthroned (1425-8), fresco, 232 x 597 cm, Brancacci Chapel, Florence. Wikimedia Commons. This painting combines the narrative of the miracle performed by Saint Peter after he was released from prison, with some early church history which took place after that miracle. Peter was taken to the tomb of the son of Theophilus, the Prefect of Antioch. The son had been dead for fourteen years, but the saint raised him from the dead. The boy is shown here amid bones from the tomb, his hands raised in amazement. Saint Peter is seen standing in front of the boy, and again in a painting hanging at the right. According to the story, this miracle so impressed the people of Antioch that they all converted to Christianity, and built a large church in the town. In the centre of that church they provided Saint Peter with a large chair, so that he could sit throughout the long sermons, and that is shown in the painting. This is another composite narrative, but this time the later event (Saint Peter sitting in his chair) is set as a picture within the picture. As might be expected in a Renaissance painting, several of the figures are believed to show important Florentines of the day. The group at the far right is of particular interest: it is claimed that they represent (from the right) Brunelleschi, Alberti, Masaccio (as a self-portrait), and Masolino. As Alberti and his family had been exiled from Florence and were not allowed to return to the city until 1428, that hardly seems feasible. Masolino de Panicale (Tommaso di Cristoforo Fini) (c 1383-1447), Healing of the Cripple and the Resurrection of Tabitha (1424-5), fresco, 255 x 598 cm, Brancacci Chapel, Florence. Wikimedia Commons. The two events depicted in this fresco are recounted in the Acts of the Apostles, although they were separated in both time and place: the healing of the cripple took place in Jerusalem (Acts 3:1-10), and the raising of Tabitha in Joppa considerably later (Acts 9:36-43). Masolino sets both events pictorially in the same town and apparently as consecutive events. One day Saints Peter and John were going up to the Temple in Jerusalem together for afternoon prayer at about 1500. A man who had been lame from birth was there; each day he used to be carried to the Temple gate known as Beautiful, so that he could beg there. As Peter and John were passing, the lame man asked Peter for money. Peter replied that he had none to give him, and instead told him to walk. The lame man jumped to his feet, and walked into the Temple courts, jumping for joy and praising God for his healing. In the town of Joppa, there was a disciple named Tabitha (or Dorcas), who was renowned for always doing good and helping the poor. She became sick and died; her body was washed and placed in an upstairs room. Saint Peter was sent for, and when he arrived, he was taken up to the room in which Tabitha’s body lay. Peter sent everyone out of that room, then prayed, and told her to get up. She opened her eyes, sat up, and was alive again. The painting incorporates both stories at the same location, which is certainly not the Temple of Jerusalem. Saints Peter and John are shown with the cripple at the left, and Saint Peter again having raised Tabitha from the dead at the right. Between the two images of Saint Peter, there are two probably Florentine figures who appear out of place. Adjustments made to the depiction of the resurrection of Tabitha are substantial: she is shown in an open area at ground level, not upstairs. In the Biblical account, Saint Peter sent everyone else from the room before he worked the miracle, but here Tabitha is shown with three other figures in the ‘room’ area. However these allow the buildings to be integrated into a single coherent view, with one-point linear perspective. Filippino Lippi (c 1459–1504), The Crucifixion of Saint Peter and the Dispute with Simon Magus (c 1481-85), fresco, 230 x 598 cm, Brancacci Chapel, Florence. Wikimedia Commons. This fresco depicts the last two episodes from the story of the life of Saint Peter: to the right we see him, with another saint, perhaps Paul, in his dispute with Simon Magus in front of the Emperor; to the left, his crucifixion. Simon the Sorcerer, the Magician, or Magus, was a Samaritan who converted to Christianity, was baptised by Philip the Evangelist, and later came into conflict with Saint Peter, as recorded in Acts 8:9–24. Following the baptism of other newly-converted Christians, Saints Peter and John went to ensure that they also received the Holy Ghost. To accomplish this, Peter and John laid hands on the Christians. Simon Magus saw this, and offered Peter and John money in return for being given the power to do the same. Peter rebuked him, for thinking that a gift of God could be bought, and called on him to repent. The influence of apocryphal literature, particularly the Golden Legend, extended this to bring Simon Magus and Saint Peter in front of the Emperor with their dispute. Saint Peter’s martyrdom is not described in the New Testament, but was familiar to most at the time from apocryphal accounts, particularly in the Golden Legend and the Acts of Peter. Tradition held that this happened in the year of the Great Fire of Rome, 64 CE, and that Peter refused to be crucified in the same way that Christ had been, as he felt unworthy. He was therefore allegedly crucified in an inverted position, as depicted in the painting. This was supposed to have taken place close to where he was buried, which was the location chosen for the Basilica of Saint Peter in Rome. Lippi shows these two events side-by-side within the same painting, with Saint Peter appearing before the Emperor at the right, and his legs being winched up on the inverted cross at the left. In the absence of any Biblical account, he has relatively free rein in what he shows, although the left background contains the very Florentine spire and towers of churches, and what may be the top of Brunelleschi’s great dome of the Santa Maria del Fiore cathedral in Florence. The original layout of these frescoes was different, in that above them, there were additional paintings which have now been lost, covered over by later frescoes. The lost paintings showed early episodes from the Gospel accounts, starting with the calling of Saints Peter and Andrew (on the left), and ending with Christ walking on the water of the Sea of Galilee (on the right). Schematics of the Brancacci Chapel with measures (in cm. 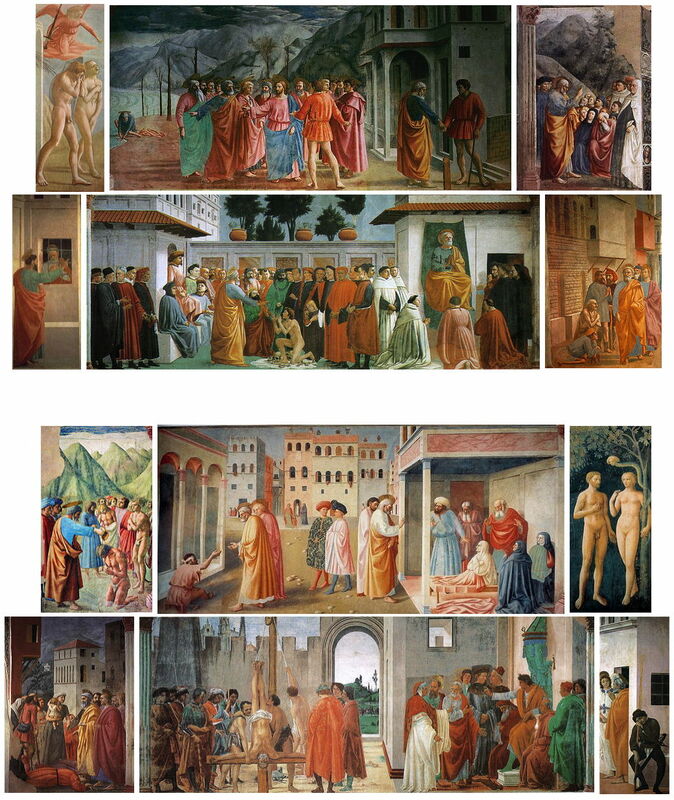 ), the frescoes, and the artists by whom they are executed: Masaccio (Mc), Masolino (Ml) or Filippino Lippi (F). The frescoes on the upper level have been painted over and are no longer visible. By Oursana, via Wikimedia Commons. 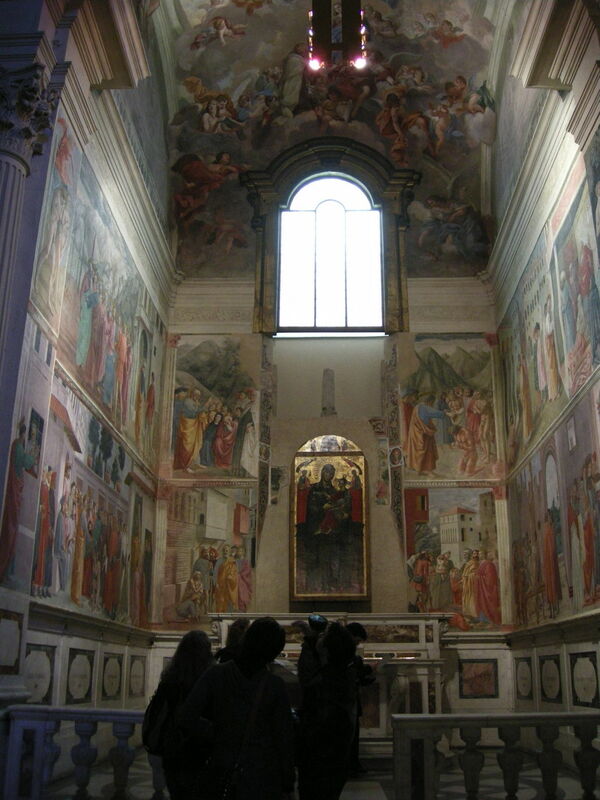 Paintings on the walls of the Brancacci Chapel. The upper half shows the left wall, the lower the right wall. Adapted from the Wikipedia entry for the Brancacci Chapel. 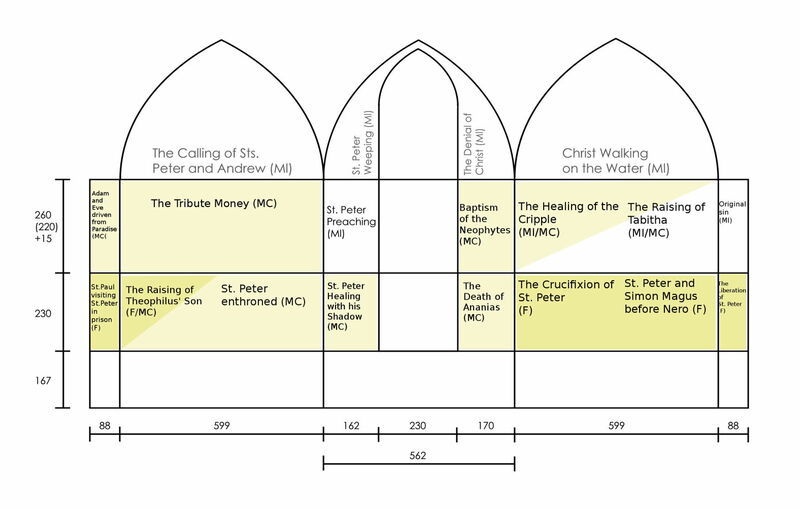 The Distribution of Alms and the Death of Ananias, The Crucifixion of Saint Peter and the Dispute with Simon Magus, Saint Peter being Freed from Prison. Although these are placed in rough chronological sequence, from top to bottom and from left to right, it is not possible to come up with a simple chronological sequence based on the placement of each painting. This should not be too surprising, as the Renaissance mind was not as concerned with strict sequence, nor with the concept of a coherent timeline. Just as the Renaissance mind was happy to cope with the non-sequential depiction of a sequence of events in The Tribute Money, so it was quite comfortable with the order of arrangement of the paintings themselves. Taken as a whole, the paintings tell the story of the Christian ministry of Saint Peter, with a particular emphasis on healing and redemption for the poor. Although this was the chapel for a rich and powerful family, the church of Santa Maria del Carmine was situated in what was, at that time, a very poor area of Florence. The episodes in Saint Peter’s life which are included appear to offer hope for those poor, that a good Christian life would be met with rewards for the spirit, if not in the material existence. I will consider the narrative techniques used in the next article. The Brancacci Chapel on Wikipedia. The Golden Legend on Wikipedia. Eckstein NA (2014) Painted Glories. The Brancacci Chapel in Renaissance Florence, Yale UP. ISBN 978 0 300 18766 3. Posted in General, Painting and tagged Lippi, Masaccio, Masolino, narrative, painting. Bookmark the permalink.